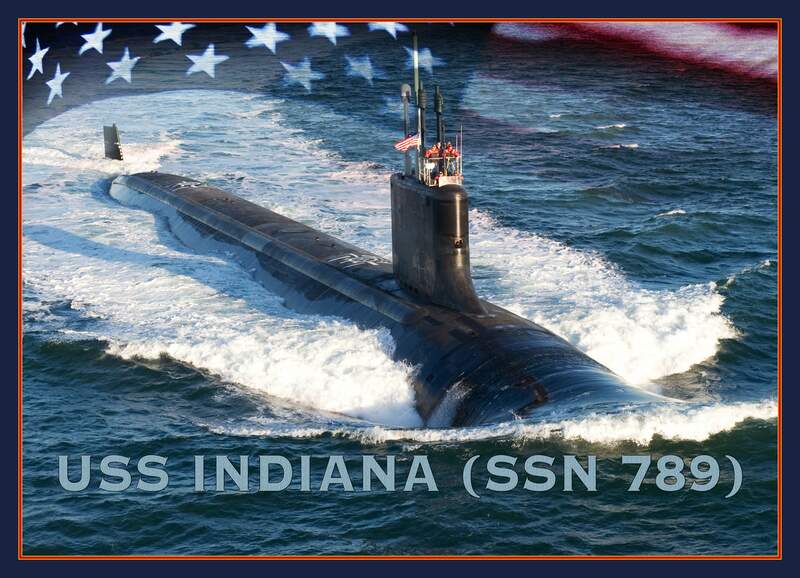 Virginia Class Attack Submarine: Named PCU Indiana (SSN-789). 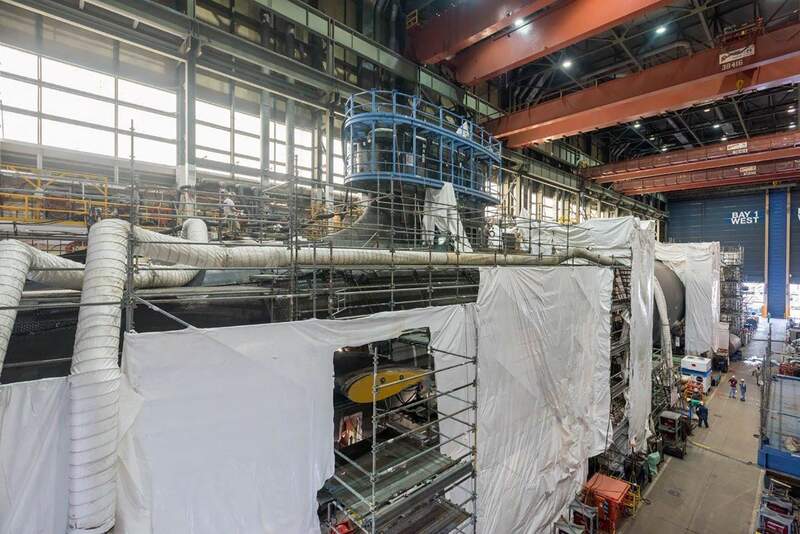 SSN-784 through approximately SSN-791 are planned to make up the Third Block or "Flight" Block III subs will feature a revised bow, including some technology from Ohio class SSGNs. 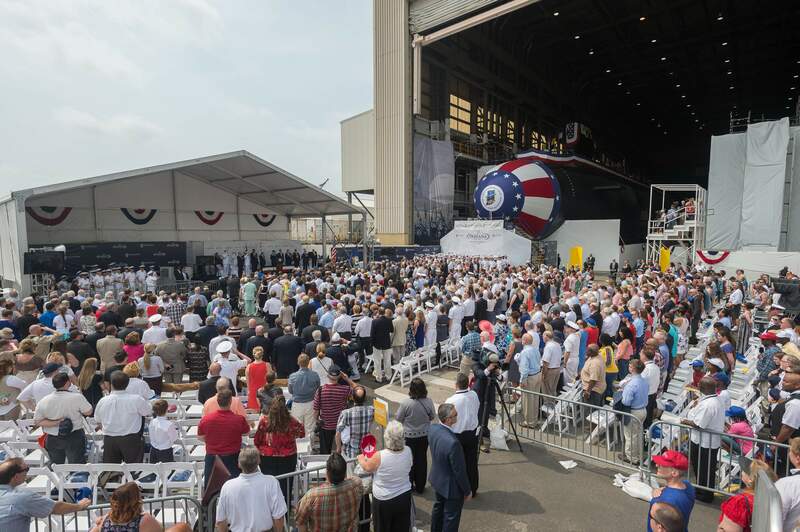 SSN-789 will be built at Huntington Ingalls Industries-Newport News Shipbuilding in Newport News, Va. Her keel was laid on 16 May 2015. 4.90k An artist rendering of the Virginia-class submarine Indiana (SSN-789), 21 June 2012. USN photo # N-ZZ999-003, illustration by Stan Bailey courtesy of navy.mil. via Ron Reeves (of blessed memory). 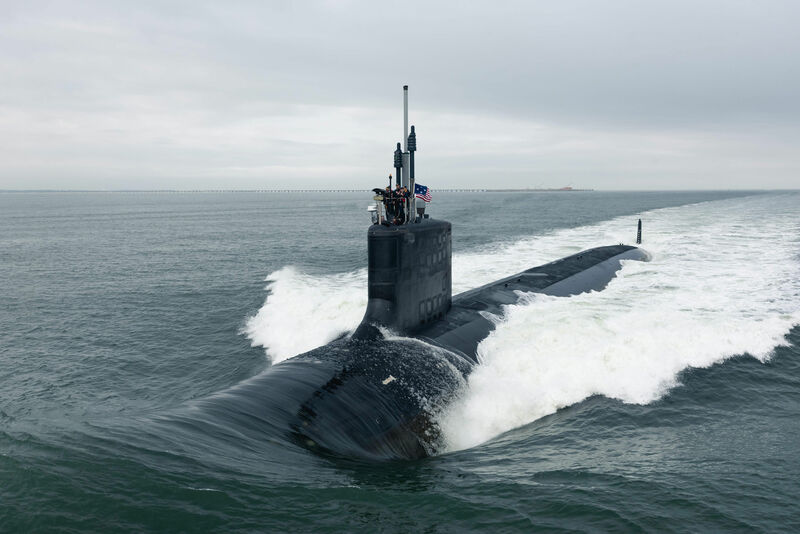 1.18k The 4,000 Newport News shipbuilders working on Indiana (SSN-789) include engineers, riggers, welders, coatings specialists, electricians, and many other trades and professions. Text & photo courtesy of huntingtoningalls.com. 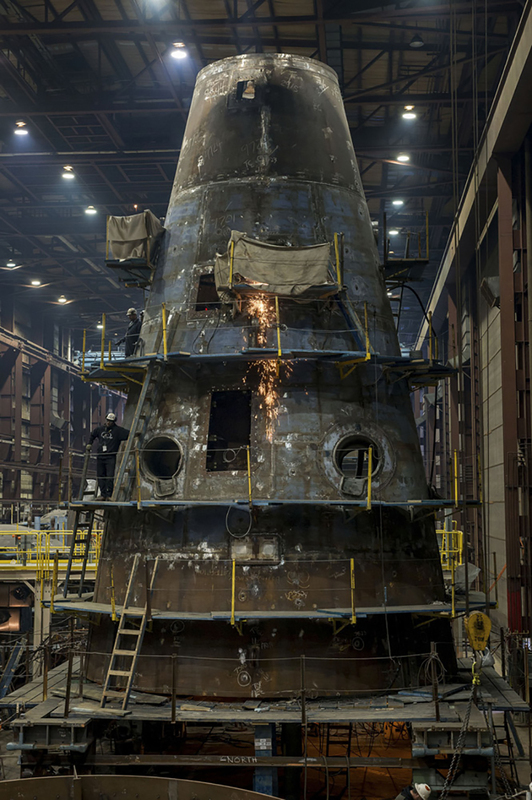 1.16k A shipbuilder on a lift works on the stern unit of Indiana (SSN-789) at Newport News Shipbuilding in 2013. Photo # DCS13-669-4 by Ricky Thompson., courtesy of huntingtoningalls.com. 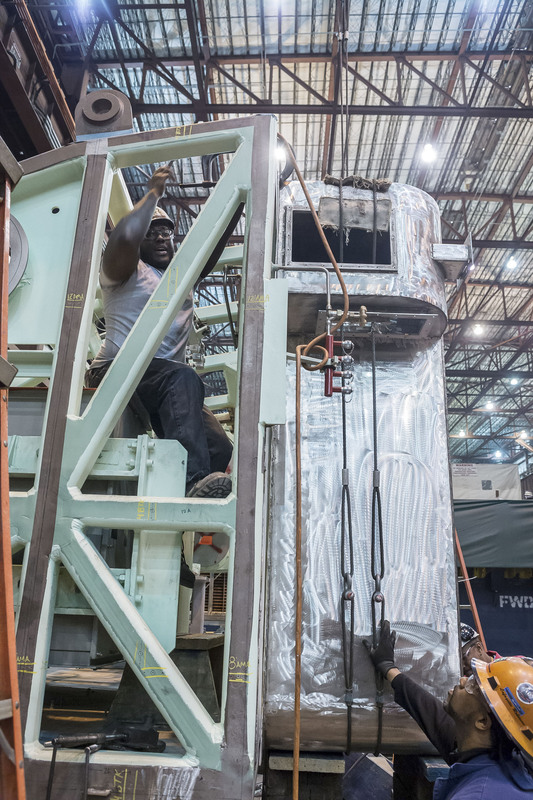 584k Newport News Shipbuilding inspector Larry Kellum checks dimensions on the submarine Indiana (SSN-789), at Newport News Shipbuilding in 2014. Photo # DCS14-254-111 by Chris Oxley, courtesy of huntingtoningalls.com. 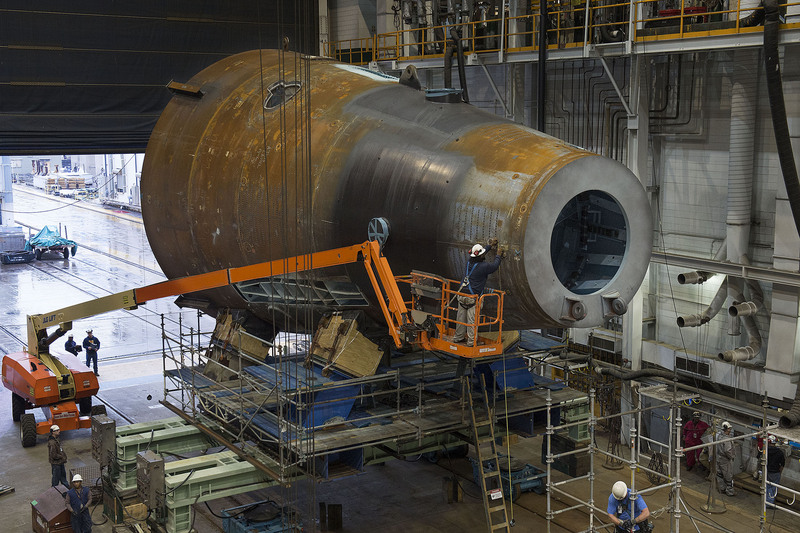 889k Shipbuilders work on the fan room for the Indiana (SSN-789) at Newport News Shipbuilding in 2014. Photo by Chris Oxley / HI, Photo # DCS14-170-91 courtesy of huntingtoningalls.com. 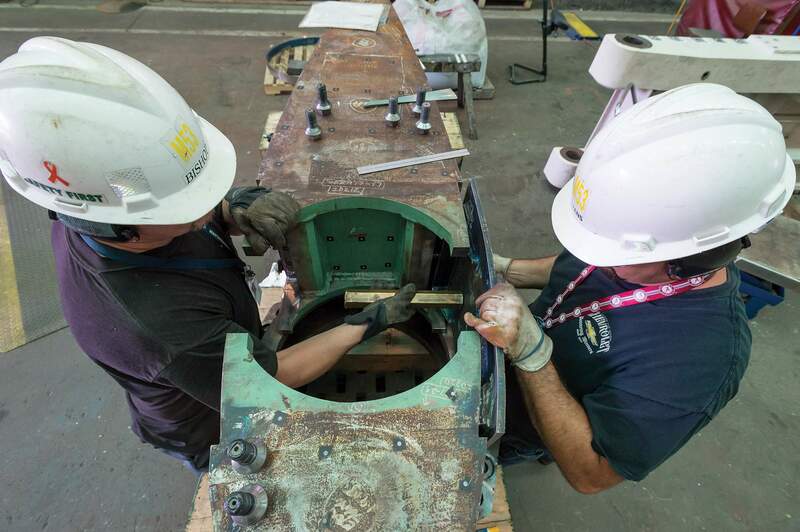 352k Mike Bishop, left, and Daniel Evans fit a plate to the fixed group on a dive plane for Indiana (SSN-789) at Newport News Shipbuilding in 2014. Photo by Chris Oxley / HI, Photo # DCS15-370-103 courtesy of huntingtoningalls.com. 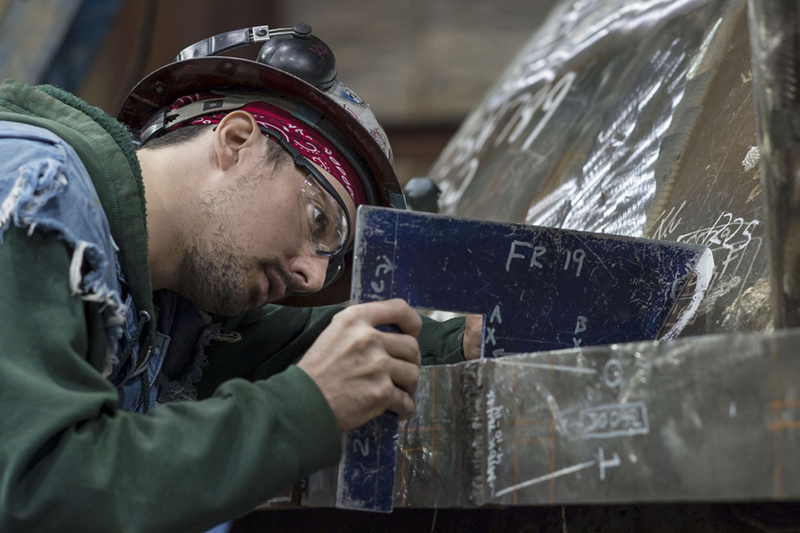 740k A shipbuilder works on the stern unit of Indiana (SSN-789) at Newport News Shipbuilding. Photo by Ricky Thompson, courtesy of huntingtoningalls.com. 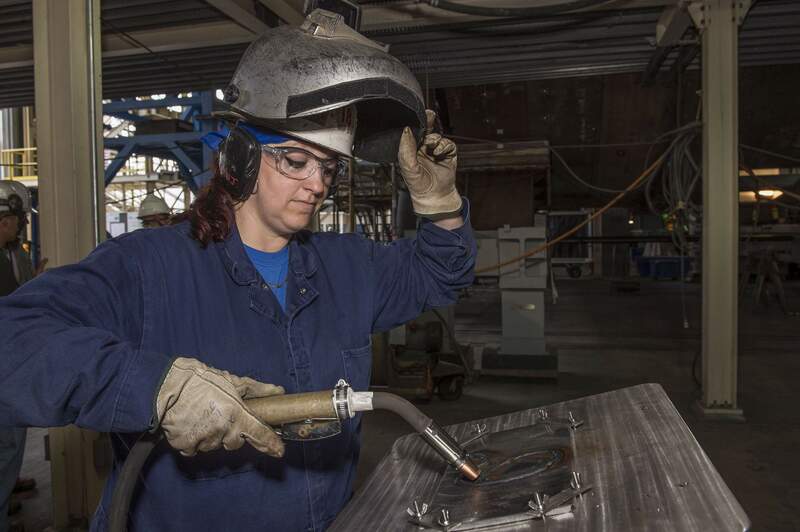 316k Heather Johnson, a 37-year-old mother of four, has the honor of being the first female welder at Newport News Shipbuilding to weld the sponsor's initials on a Virginia-class submarine. Text & photo courtesy of huntingtoningalls.com. Photo # DCS15-298-22 by John Whalen / HII. 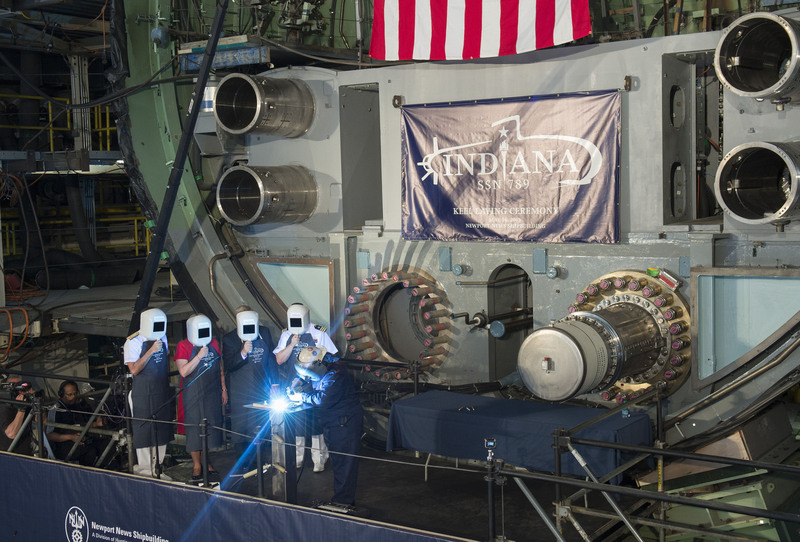 316k A welder carves the initials of ship's sponsor Diane Donald on a metal plate during the keel laying ceremony for the future submarine Indiana (SSN-789) on 16 May 2015. Text & photo courtesy of huntingtoningalls.com. 578k Ship's Sponsor Diane Donald and Newport News Shipbuilding President Matt Mulherin (center) pose for a group photo with the official party inside one of the submarine Indiana's (SSN-789) units. Text & photo courtesy of huntingtoningalls.com. 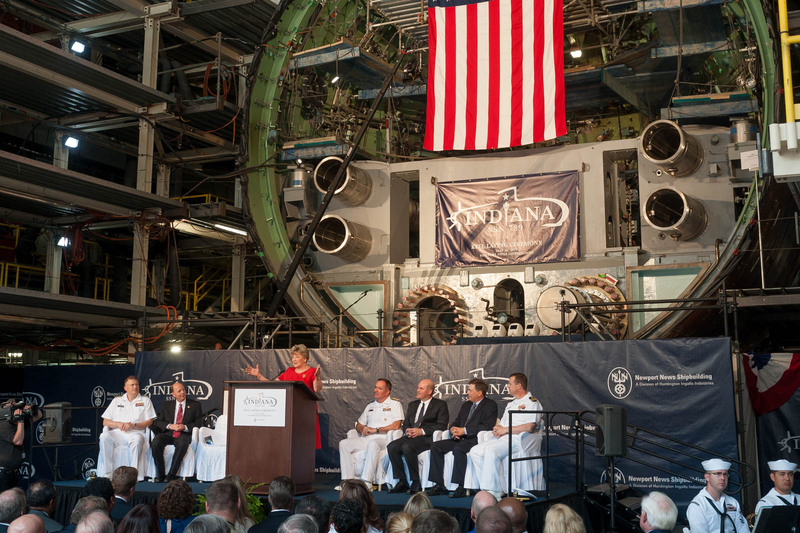 578k Ship's Sponsor Diane Donald addresses the ceremony guests: "How fitting to have the construction of this ship, SSN 789, completed in Newport News Shipbuilding, where the last Indiana (BB-58), was built to withstand the test of war at sea during World War II." Text & photo courtesy of huntingtoningalls.com. Photo 15_DCS15-309-716 by Chris Oxley. 578k Ship's Sponsor Diane Donald chalks her initials onto the steel plate. Text & photo courtesy of huntingtoningalls.com. Photo 17_DCS15-308-300 by John Whalen. 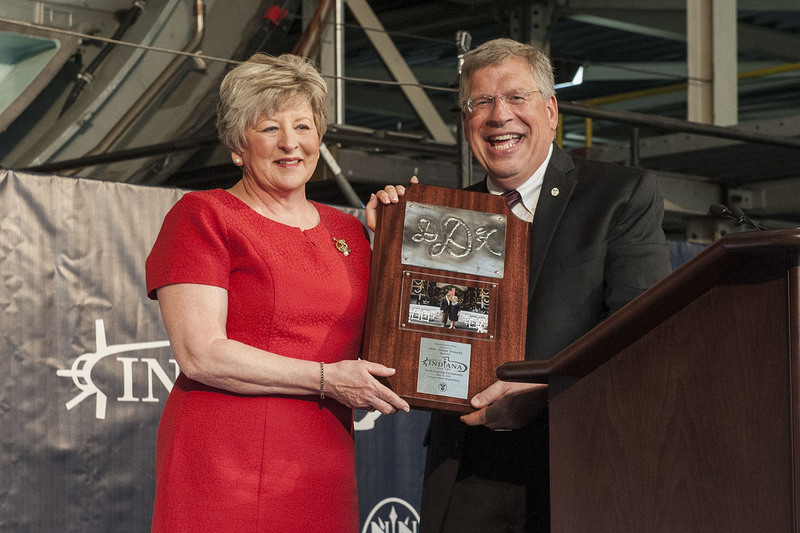 578k NNS President Matt Mulherin presents Diane Donald with a gift commemorating the keel laying. The plaque features a replica of the steel plate welded during the ceremony and a photo of her and husband ADM Kirkland Donald in front of the submarine unit. Text & photo courtesy of huntingtoningalls.com. Photo 24_DCS15-308-469 by John Whalen. 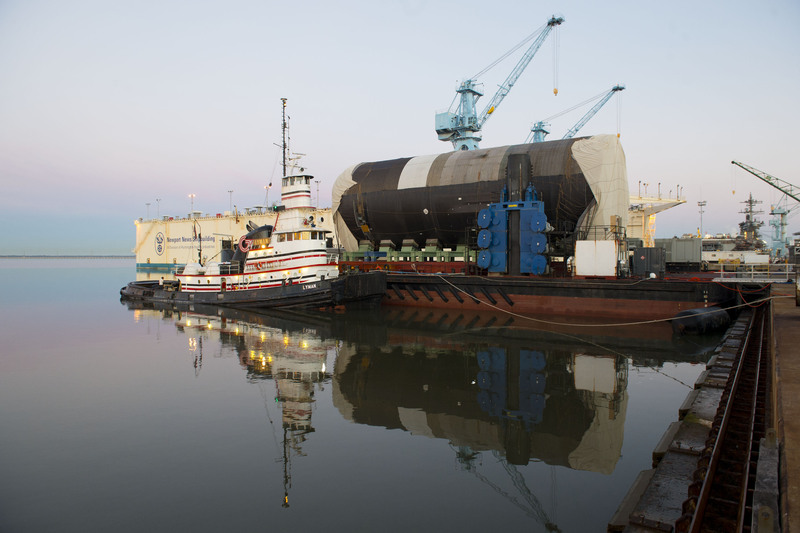 579k Unit 2B of the Indiana (SSN-789) arrives at Newport News Shipbuilding from Electric Boat. Text & photo # DCS16-134-5 courtesy of huntingtoningalls.com. 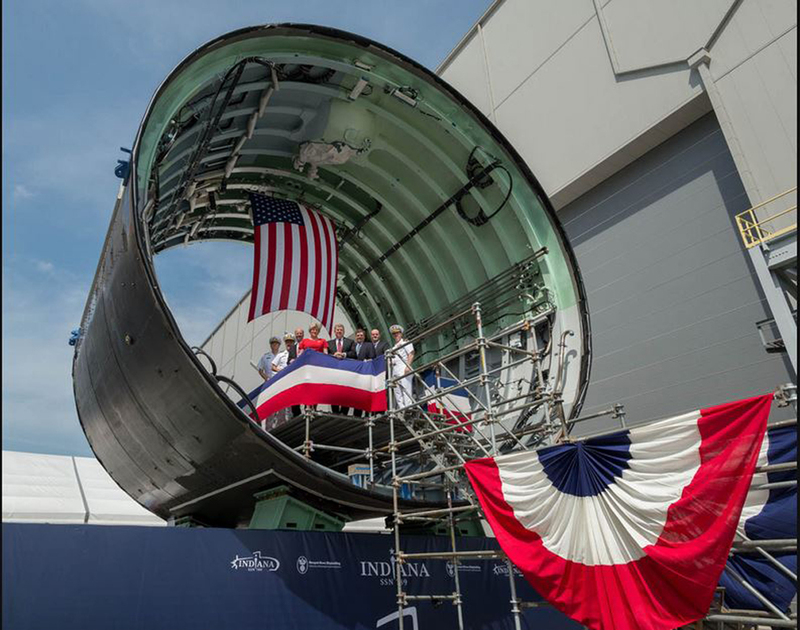 267k Indiana (SSN-789) has reached pressure hull complete, signifying that all of its hull sections are joined to form a single, watertight unit. Text & photo courtesy of huntingtoningalls.com. Photo by Chris Oxley via Ron Reeves (of blessed memory). 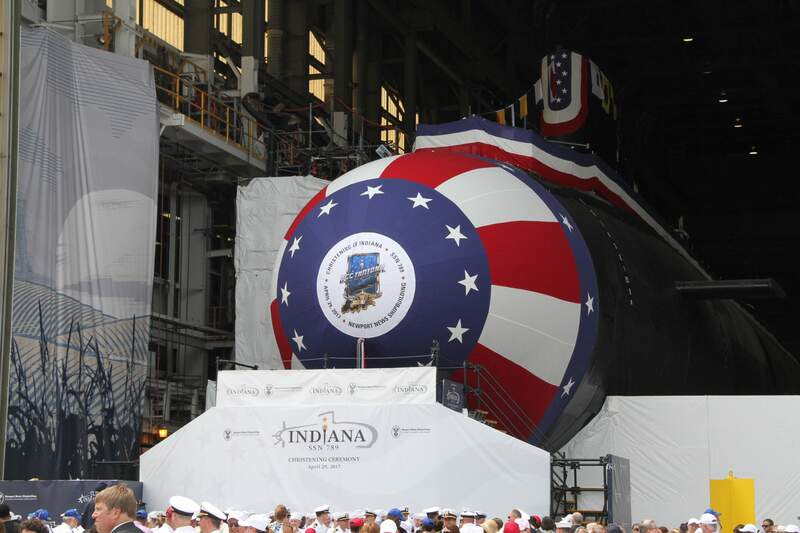 549k Pre-christening photo of the Indiana (SSN-789), 29 April 2017. Photo courtesy of Dale Hargrave. 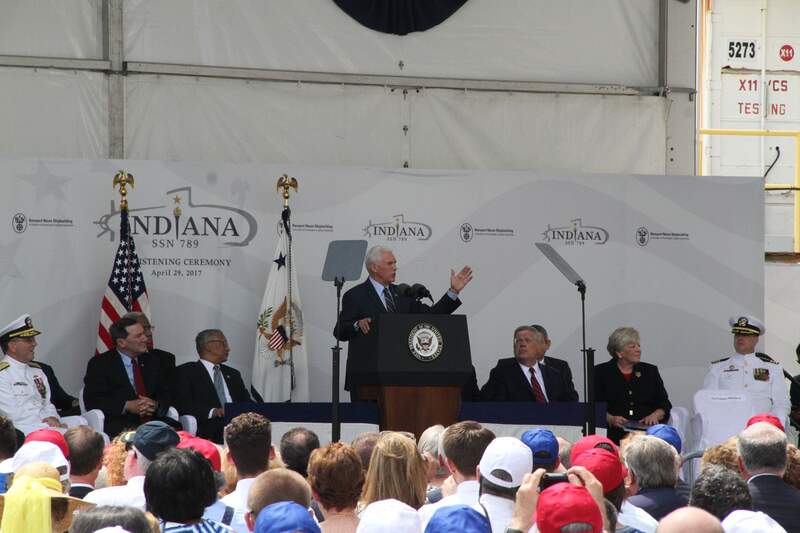 552k Vice President Pence delivering the keynote speech. Photo courtesy of Dale Hargrave. 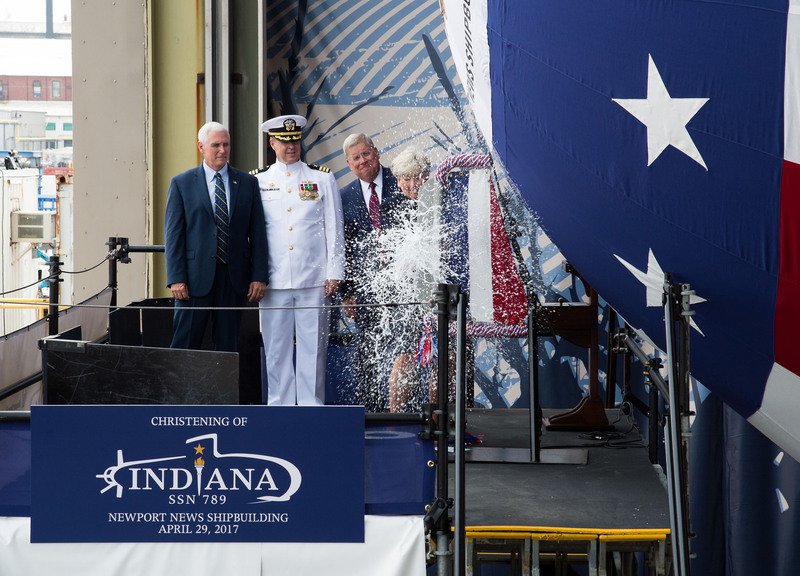 1.23k A view of the events during the christening of the Indiana (SSN-789), 29 April 2017. Photo courtesy of newsroom.huntingtoningalls.com. 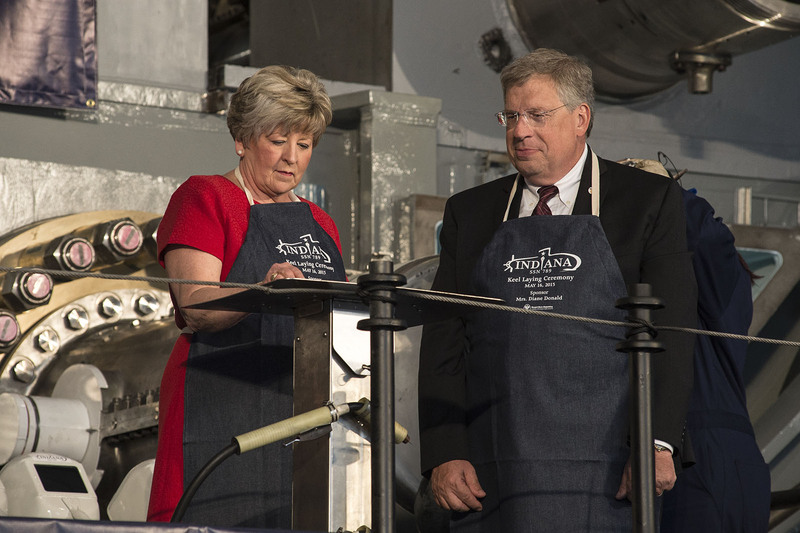 889k Indiana (SSN-789) Sponsor Mrs. Diane Donald does the honors on 29 April 2017. Photo courtesy of newsroom.huntingtoningalls.com. 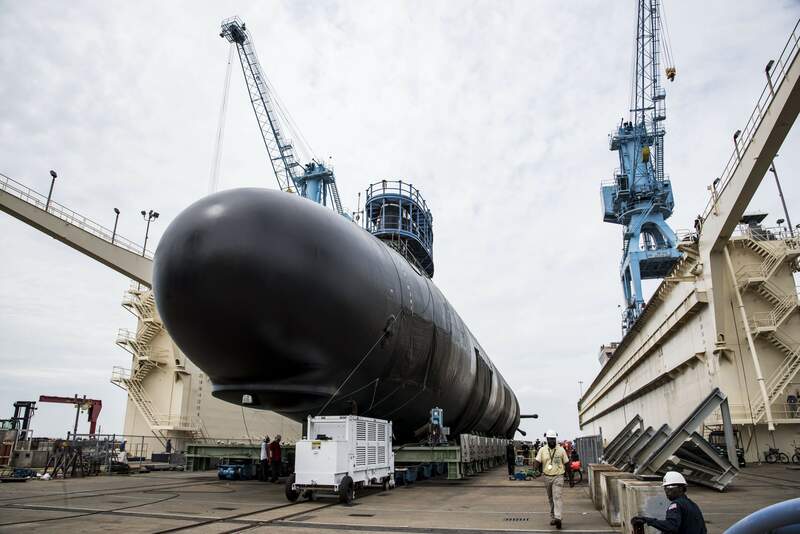 2.29k Indiana (SSN-789) has been launched into the James River and moved to Newport News Shipbuilding's submarine pier for final outfitting, testing and crew certification, 9 June 2017. Photo by Ashley Major/HII via Ron Reeves (of blessed memory) & newsroom.huntingtoningalls.com. 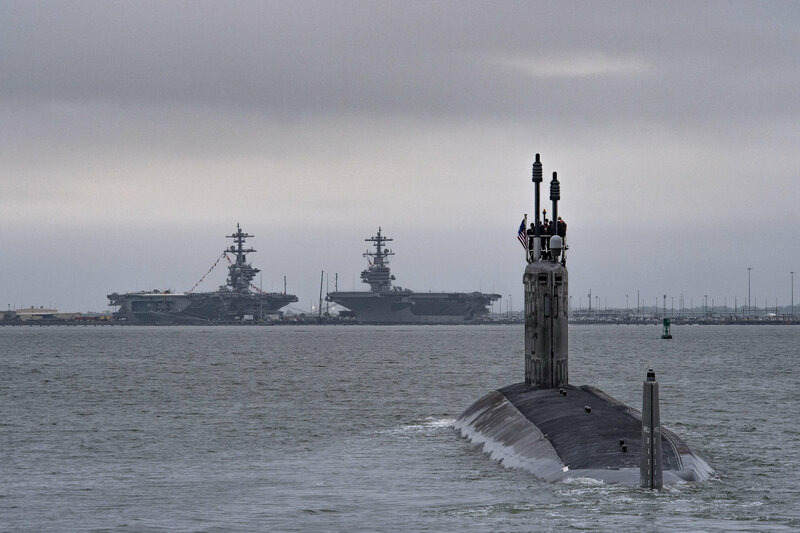 524k Indiana (SSN-789) Departs for Sea Trials, May 2018. Carriers in the background are George H.W. Bush (CVN-77)(right) and Abraham Lincoln (CVN-72), fully dressed for the Carrier Strike Group 12 change of command ceremony, 22 May 2018. Text via Fabio Pena. Photo # DCS18-376-505 courtesy of huntingtoningalls.com. 802k Indiana (SSN-789) in the Chesapeake Bay, 25 May 2018. Text & photo # DCS18-377-281 courtesy of huntingtoningalls.com. 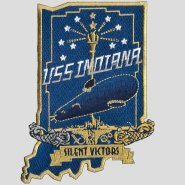 There is no DANFS History currently available for Indiana (SSN-789) at the Haze Gray & Underway Web Site, the main archive for the DANFS Online Project.